Most of us will end up with a sunburn at least once during the summer, so you probably already know how uncomfortable they can be. Here are some of the best products that you can use to relieve the discomfort you may be experiencing from that pesky sunburn. Has your sunburn left your skin sensitive and in pain? If so, try using this cooling gel product—which can be applied to both your face and body. This yogurt and sweet almond oil formula offers immediate relief to a burning, inflamed sunburn once applied. You can find this product at korresusa.com. Pain relieving products such as ibuprofen can be taken to reduce discomfort of your sunburn. It also has anti-inflammatory medications to help reduce swelling you might also experience. However, For children under 18, pain-relieving acetaminophen products, such as Tylenol, are preferred instead of ibuprofen. Aloe vera is a go-to treatment for sunburns because the topical gel works so well to soothe and cool the skin. Remember to check out the ingredient list before applying aloe products, though—other ingredients like benzocaine or lidocaine can cause more skin irritation or an allergic reaction. When applying sunscreen, it's easy to forget about protecting your mouth. Sometimes you can end up with sunburned lips, which is as painful as it sounds. If you do end up with this issue, try this honey, myrrh, and lanolin balm for soothing pain relief. You can find this product at osmiaorganics.com. While this product is more expensive than some others, it comes from a line that is committed to providing products that are calming and comforting. The Aromatherapy Associate Soothing Treatment Mask stands out because of its rich moisturizing formula. Use this product on a sunburn for pain and irritation relief. You can buy this product at aromatherapyassociates.com. A severe sunburn can sometimes cause an extreme itchiness. 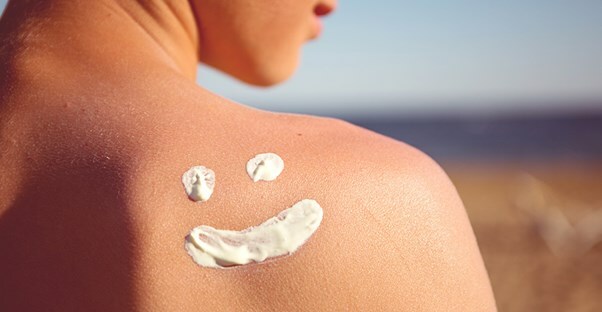 For relieving an itchy sunburn, you can try using 1% hydrocortisone cream—which is a topical product that can relieve pain and swelling, both of which can lead to itchiness. However, the cream should not be used on children under the age of 2. Itching can also be relieved by taking oral antihistamines such as Benadryl. This product provides pain relief, but should not be given to children either. Calamine is a topical anti-itch lotion that has skin protecting and astringent properties. Not only can this lotion help with your sunburn itch, but it can also relieve pain. Make sure to keep the lotion out of your eyes, though. What's the Chance of Getting Skin Cancer from a Sunburn?